Prepare our sparkling ruby punch, and let little ones discover shiny stimulation bottles during this colourful theme. Posters, activity sheets and many other printable documents to help you explore precious stones. 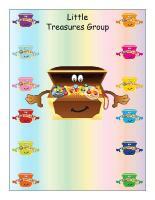 (Open thematic poster-Precious stones) Print, laminate, and decorate the walls of your daycare with all kinds of posters. (Open educa-decorate-Precious stones) Print, cut out, and laminate. Use the illustrations to decorate the walls of your daycare and set the mood for the theme. 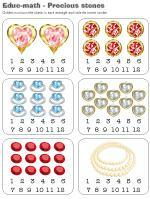 (Open educa-numbers-Precious stones) Print and laminate the posters. Display them on a wall throughout the theme. 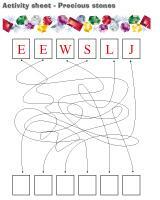 (Open educa-letters-Precious stones) Print and laminate the posters. Display them on a wall throughout the theme. (Open garland-Precious stones) Print. Let children decorate the garland. Cut it out and hang it within your daycare or near your daycare entrance. Hang Christmas garlands (the ones that look like necklaces) from the ceiling. Stick colourful cellophane paper in your windows to make them look like jewels. (Open models-large jewels) Print. Let children decorate the jewels. Cut them out and hang them within your daycare or near your daycare entrance to form a garland. This special tool was created in response to a special request received. (Open group identification-Little treasures) Print and display in a specific corner of your daycare or near your circle time area. 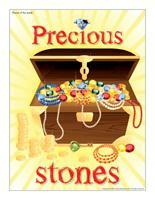 (Open Poni discovers and presents-Precious stones) Print the cards and laminate them. Cut them out. Use a Poni puppet (available in our online store) or another puppet the children in your group are fond of to present the precious stones. Deposit a jewellery box filled with necklaces, rings, and other sparkling items on a table during circle time. Make special hats and have children decorate them by gluing fake precious stones or glitter on them. The pictures may be used as a memory game or to spark a conversation with your group. Use them to decorate your daycare or a specific thematic corner. 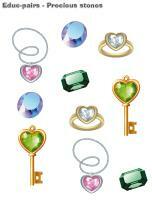 (Open picture game-Precious stones) Print, laminate, and store the pictures in a Ziploc bag or in your thematic bin. 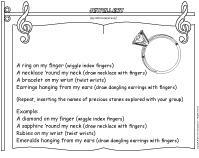 (Open activity sheets-Precious stones) Activity sheets are suggested for each theme. Print and follow instructions. (Open writing activities-P like precious) Print for each child or laminate for use with a dry-erase marker. 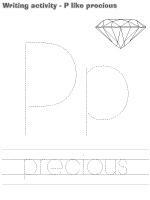 (Open stationery-Precious stones) Print. The stationery can be used to communicate with parents, in your writing area, or to identify your thematic bins. (Open picture clue story-Trip to the jeweller's) Print. Sit in a circle with your group. Begin reading the story and pause each time you reach a picture clue. Children must guess the missing word. (Open sequential story-Precious stones) Print, laminate, and cut out the illustrations. Children must place them in the correct order to recreate the story. (Open game-This is my spot-Precious stones) Print two copies. Laminate and cut out the cards. Glue one copy of each card on the table using adhesive paper. Drop the other copies in a bag. Children take turns picking a card to determine their spot at the table for the day. You may also use the cards to determine naptime spots or for your task train. (Open my precious stone path) Print, laminate, and secure the illustrations on the floor to create a path leading to areas frequently visited throughout the day such as the cloakroom or bathroom. If you prefer, the illustrations may also be used to delimit your various workshops. Prepare special stimulation bottles for the little ones in your group. Fill them with glitter or shiny decorative beads to represent precious stones. Seal them with hot glue. Cover your daycare windows with colourful cellophane paper. Little ones will enjoy exploring the different colors when they look out the windows. 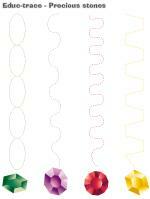 Purchase large lacing beads or use colourful rigatoni noodles to introduce young children to lacing. (Open lacing-Precious stones) Print, laminate, and cut out the shapes. Punch holes around the contour of each shape. Provide shoelaces (tie a knot at one end of each shoelace). Let children thread a shoelace through the holes. (Open small precious stones) Print and cut out enough precious stones to ensure each child has at least ten. Deposit all the precious stones on a parachute or blanket. Children hold on to the edge of the parachute. When you give them the signal they must raise the blanket up to send the precious stones flying through the air. When the precious stones fall to the ground, children collect as many as possible. If you wish, you can count how many each child collected. (Open models-Precious stones) Print and laminate several different stones. Arrange them on the floor to represent stepping stones in a river. Encourage children to hop from one stone to the next. Organize a treasure hunt in the yard. Decorate a cardboard box to create a unique treasure chest. Fill it with chocolate pieces wrapped in gold paper and pretend precious stones. Let each child bring his share of the treasure home at the end of the day. (Open colourful precious stones) Print, laminate, and cut out the precious stones. Set the precious stones on the floor to create a path. To the sound of music, encourage children to walk from one precious stone to the next. When the music stops, name a color. Each child standing on a precious stone of the corresponding color may pick a surprise out of a treasure chest. If you prefer, you can ask children to perform a simple action such as sing a song or jump three times. Hide fake precious stones in your sandbox. Invite children to search for the precious stones with sifters just like gold diggers. (Open educ-pairs-Precious stones) Print. Children must draw a line between identical items or color them using the same color. For durable, eco-friendly use, laminate for use with a dry-erase marker. 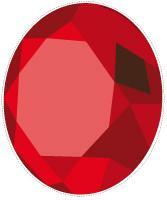 (Open educ-trace-Precious stones) Print for each child. Children must trace the lines using the correct color and then color each item using the corresponding color. 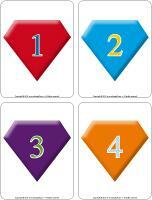 (Open educ-big and small-Precious stones) Print the cards. Invite children to arrange them in the squares in ascending or descending order. (Open educ-math-Precious stones) Print and laminate for durable, eco-friendly use. Children must count the objects in each rectangle and circle the correct number. (Open Bingo-Precious stones) Play bingo with your group. Print, laminate, and store the cards in a small box or Ziploc bag. 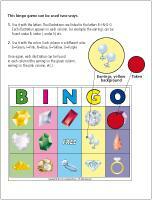 Use plastic precious stones or colourful cereal pieces as bingo markers. Dye pasta pieces (rigatoni, penne, wheels, etc.) and tell children they are magnificent precious stones. Invite them to use them to create a pretty necklace for a friend or family member. Variation: Mix pasta pieces with a small amount of glue and glitter. Spray several rocks with gold paint and hide them in your sandbox. Encourage children to find them using sifters, spoons, or other accessories. Make your own salt dough. Use the dough to make heart shapes or simple round beads. Use a drinking straw to punch a hole through each piece so you can thread them on ribbon or string once they are cooked. Children can also paint the pieces before using them to create necklaces. Variation: If you prefer, you could use painted pasta pieces. There are so many different shapes available. Combine all the ingredients together until the mixture is smooth. Wrap a piece of salt dough around each child's finger and flatten the top so you can glue a plastic precious stone on it once the dough is cooked. Fill the centre of the ring with a piece of aluminum paper and bake at 250 °F for at least an hour. Paint the ring. Once the paint is dry, add a coat of varnish. Give each child a bowl filled with Froot Loops cereal. Have them thread the cereal pieces on liquorice string. 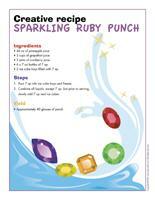 (Open creative recipe-Sparkling ruby punch) Print. Fill two ice cube trays with 7 up and deposit them in the freezer. Combine all liquids, except the soft drink. Just prior to serving, slowly add 7 up and ice cubes. (Open models-Precious stones) Print several copies. Use the models for various crafts and activities throughout the theme. (Open puppets-Jeweller) Print the puppet models on heavy cardboard. Have children cut them out and decorate them. Glue Popsicle sticks behind each model. (Open stencils-Precious stones) Print and cut out the various stencils. Children can use them to trace or paint elements related to the theme. 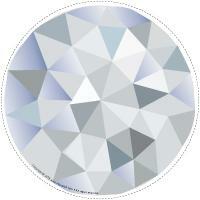 (Open educa-shape-Precious stones-Diamond) Print several copies. Have children color the shapes. When they are done, have them cut them out and assemble them to create a necklace. This activity can be done individually or as a group using the small, medium, or large shapes. Invite children to complete their necklaces by adding glitter. (Open jewel models) Print. Cut a strip of construction paper for each child (about 2 cm wide). Cut out the jewels and have children glue the ones they prefer on their strip of paper. When they are done, use glue to fasten the two ends and create a bracelet (or a necklace). Collect several different types of boxes and containers. Have each child choose one and encourage them to paint it. Once the paint is dry, provide plastic gems they can use to decorate their jewellery box. (Open complete the drawing-Precious stones) Print for each child. Children must complete the drawing by adding the missing elements. (Open I am learning to draw-A necklace) Print and laminate the model sheet. Invite children to practice their drawing technique on the model sheet. When they are ready, they can try to draw a necklace on their own. 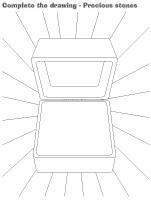 (Open coloring pages theme-Precious stones) Print for each child.